Cleans Windows, Screens, & Glass at the Same Time! No need to remove screens - Cleans screens & windows at the same time! Make Cleaning All Your Windows Fast & Easy ! 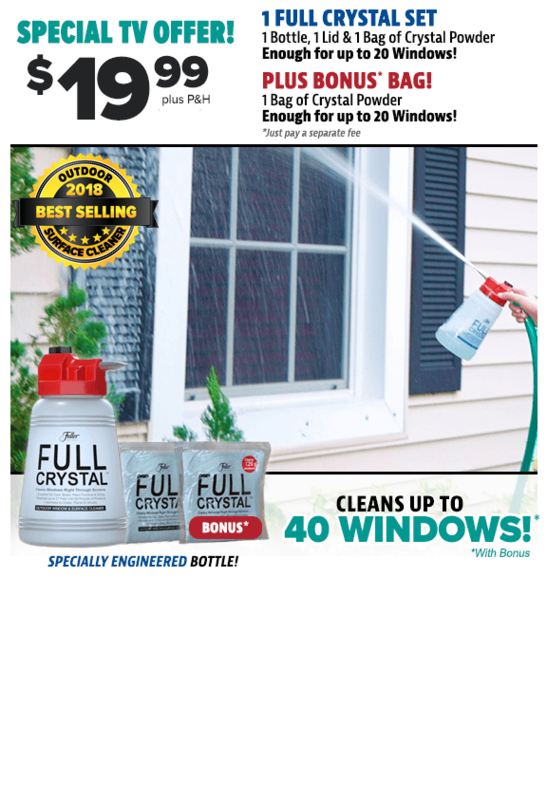 Full Crystal is the Ultimate Window Cleaning System! No More Ladders! Great for those hard to reach second story windows! Offer Details: When ordering today, you will receive 1 Full Crystal ™system, which includes, a bottle, lid and one bag of Full Crystal™ powder, for only $19.99 plus $7.95 P&H PLUS as a special bonus you will receive a second bag of Full Crystal Powder just pay a separate fee of $4.99.